A bright tableau of lederhosen- and dirndl-clad dancers graces the facade of Mount Angel's Festhalle. The city unveiled a new mural on the Festhalle Tuesday, the finishing touches on the communal gathering and party venue. 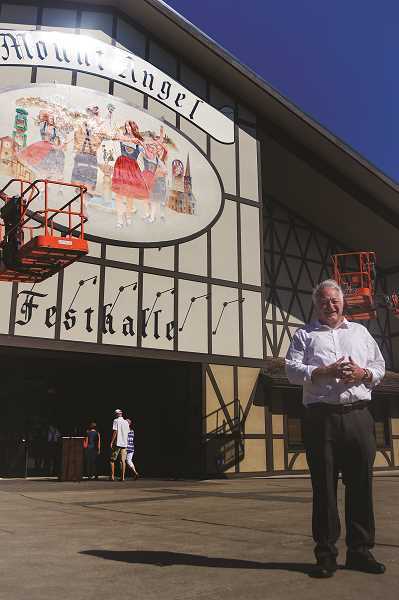 The mural, painted by Silverton artist David McDonald, depicts jubilant dancers ringing the fountain downtown with Mount Angel landmarks such as the Abbey, Benedictine Sisters, the Glockenspiel and train station in the background. The mural is painted in oil, on five large aluminum panels 26 feet wide by 18 feet tall. It took McDonald 10 weeks to complete the painting. A large crowd turned out to see the unveiling and a blessing of the mural by Father Philip Waibel of St. Mary's Parish. "It's not perfect, but the painter tried his best," said McDonald, laughing. 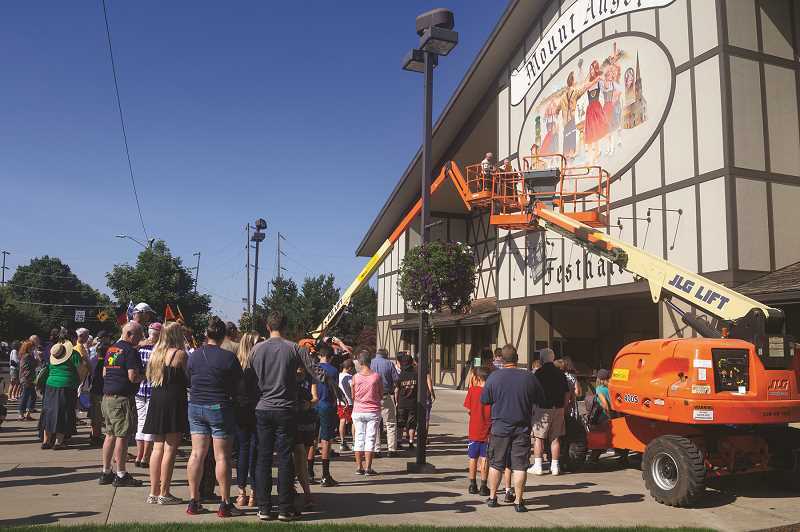 Father Waibel was lifted up to bless the mural at eye level in a crane lift. As the crowd admired the mural a DJ played Oktoberfest oompah music and made sausage puns. "The whole thing's a bit silly," McDonald said about the festivities. Mount Angel Community Foundation member John Gooley gave the opening remarks during the unveiling. Gooley described how the Festhalle was finished step by step: first the kitchen, then flooring, sound system and finally cooling fans. The mural was the last piece left undone. "Michael Roth asked what else needed to be finished," Gooley said. "Between Roth and the chamber we got it all funded." The mural project received $10,000 from the Roth Family Foundation, $3,000 from the Mount Angel Chamber of Commerce, and $1,000 from the Elaine Annen Trust. Gooley also thanked GK Machine of Donald, the Roth Foundation, Herc Rentals of Salem, Big Sky Construction and Festhalle architect Victor Madge.